So if you follow me on Facebook (and if you don't do eet nao! ), you saw the picture I posted yesterday of all the stuff I was trying to peddle at the 4th Street Market. I guess you can consider it a slight speak peak because I had lots of stuff for sale that I haven't blogged about yet. So, here is the first of those items! I had these chairs sitting for a while before I did anything with them. When I bought them I didn't have a plan, they just had good bones. When I was browsing fabric one day, I ran across this pretty blue and tan floral fabric. I instantly thought of 2 things at once (look at me multitasking! 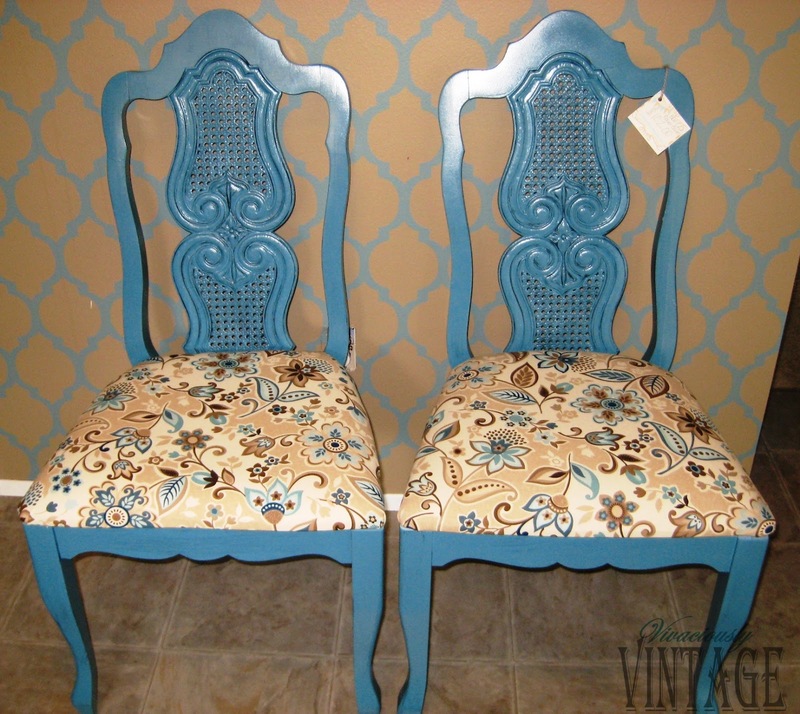 ): this pair of chairs and Krylon's Ocean Breeze paint. I see Ocean Breeze saturating blogland, and it always looks so pretty on everyone's projects. I've sort of been itching to try it. Part of the delay is they don't carry that color where I normally get my paint. Well, I finally found it! I have to say, I was a little disappointed. It just didn't look like it does online...so I passed it up....because right next to it was another color I had yet to meet. It is called Bahama Sea. Side by side that color won my heart hands down over the Ocean Breeze. So, I snagged several cans and immediately ran to get that fabric that had neglected to buy since I hadn't discovered those spray paint colors yet. So, they underwent my usual painting transformation. Remove old cushions, clean thoroughly with a deglosser, prime with KILZ, and paint with my new Bahama Sea. I never keep track of my number of coats. I just spray until it looks good. Sometimes I have to backtrack because I'll get a piece in the house...then, thanks to the better light, see a spot I missed. 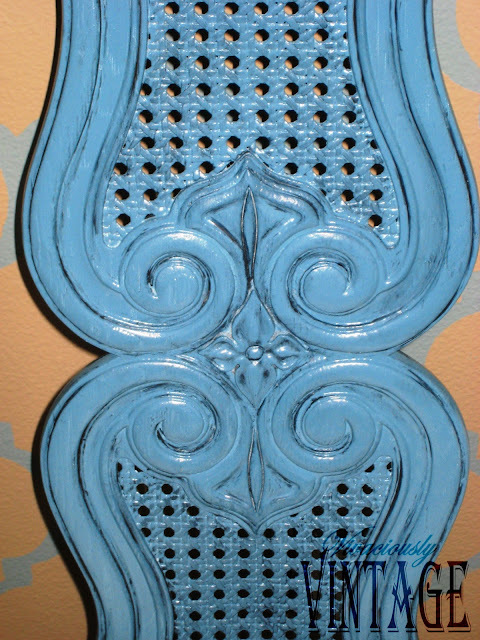 After all the painting, I dry glazed all of those pretty details on the backs of the chairs. I also went over the flat parts a bit for more depth. While that was drying, I stapled the new fabric onto the chair cushions. A simple transformation that can be done in a day! Closeup of the pretty glazing detail! Yes that's a price tag on the right chair! Tickle your toosh with these tantalizing chairs! Available in my "shop". Hi Jacqui! Yes that it cane in the center of the chair backs. It painted really well. :) You should show these to him, or do what I do - wait until he leaves and paint whatever you want! :) Good luck! These look great! 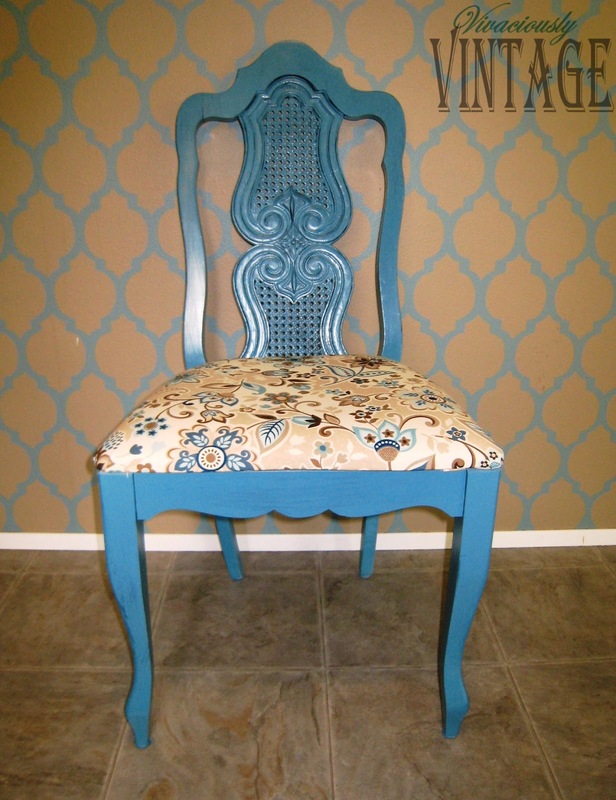 I'm on the look out for some way to spruce up my dinning room chairs. Thanks for the idea! Thank you so much! I'll be sure to check your linky party out...I love them! I love the color of the chairs, they turned out great!! !